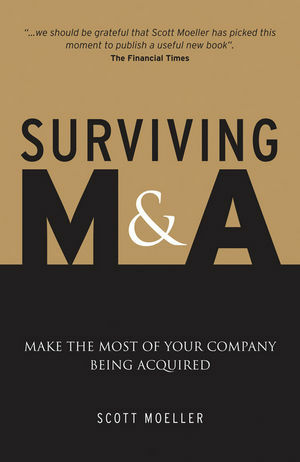 This blog is a companion to a forthcoming book to be published by John Wiley & Sons in July 2009: ‘Surviving M&A: Make the most of your company being acquired’. You can see it on the Wiley website here. It’s already available for pre-order on Amazon.co.uk in the UK and can be seen on Amazon.com in the US (but not yet available to be purchased from the US site). This blog will hopefully provide readers and potential readers of this book with the opportunity to share their own stories about how they survived when their company was acquired. Or perhaps with some suggestions on what they wish they had done differently if they weren’t a survivor. If you would like to provide some tips or suggestions, please do so HERE on this page of this weblog. The book was produced following hundreds of interviews on this topic with individuals who had lived through deals. But with tens of thousands upon tens of thousands of people being laid off each year because of mergers or acquisitions, there must be some suggestions we’ve missed. Please do share your stories with us. Thank you. Additionally, in this blog we will update stories that are contained in that book and will provide readers with a forum to provide commentary (please click HERE if you would like to add a story). It has been exciting to produce the book and to see where it might help many people facing possibile redundancy; help us make it even better.